Infosys Technologies Ltd met Street expectations on revenue for the quarter ended September and even exceeded consensus profit estimates thanks to better-than-expected margins. Its net profit of Rs1,540 crore was around 3.4% higher than the consensus estimate of 15 analysts, according to data compiled by Bloomberg. 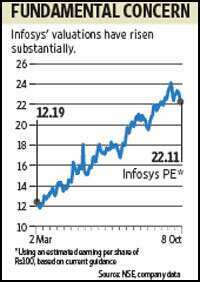 Infosys shares fell by 1.4% to Rs2,181 on Friday, more or less in line with the 1.19% fall in the benchmark Sensex, taking the overall correction in the company’s valuation to about 10% compared with its recent high of Rs2,421. Infosys reported revenue of Rs5,585 crore, almost exactly in line with Street expectations, and 2.1% higher than revenue in the June quarter. Revenue grew 1.2% in constant currency terms, which refers to revenue growth stripped of the impact of currency movements. This comes after three consecutive quarters of a decline in revenue and in that light is nothing to be excited about. Volumes grew by 2.3% sequentially, while average price realization fell by 1.1% in constant currency terms, leading to the unexciting growth in revenue. Chief operating officer S.D. Shibulal pointed out in a conference call with analysts that the drop in pricing is the result of a tailwind effect of pricing renegotiations in the past few quarters. For the year as a whole, pricing is expected to decline between 4.5% and 5% due to these renegotiations. The company has raised its guidance target for the year, but this fell short of Street expectations. In July, the company had said it expects revenue of between Rs21,416 crore and Rs21,747 crore in FY09. It has raised this to between Rs21,961 crore and Rs22,055 crore. This implies that it expects revenue to grow by only about 1% sequentially in the next two quarters. This again runs contrary to the Street’s prognosis that the environment for IT spending has improved considerably. V. Balakrishnan, the company’s chief financial officer, points out that the management is cautious about the short term since clients are still tentative about next year’s technology budgets and the improvement in sentiment has to still conclusively translate into spending on the ground. According to the head of research at a domestic institutional brokerage, the firm is taking the “cautious" stance too far. Another analyst at a foreign brokerage echoes this by saying that Infosys is being extremely conservative this year after missing its guidance in the previous fiscal year. According to him, the guidance for almost flat growth doesn’t fit with Infosys’ decision to increase its gross hiring target from 18,000 earlier to 20,000 employees and to give an aggressive 8% pay increase to its employees. The argument is that these decisions would not have been taken if the growth outlook wasn’t bright. With the company surprising on the margin front, there may be some earnings upgrades. 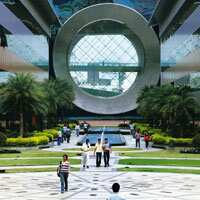 Infosys has been aggressively cutting costs, as is evidenced by a large rate of employee attrition. As many as 4,521 employees left the company in the September quarter, almost the same as the June quarter. On an annualized basis, this works out to an attrition rate of 17%. According to the company management, there was a one-time involuntary attrition in the June quarter based on an annual evaluation process. The fact that attrition continues to be high at over 17% suggests that Infosys is still aggressively letting go of people. It seems unlikely, after all, that voluntary attrition would be very high during a slowdown. With freshers replacing experienced hands at an increasing pace quarter after quarter, the company’s cost base will get leaner. This, of course, will be offset by the 8% wage hike granted by the company effective October. But in the long term, the employee cost structure seems to be slimming down. Still, as pointed out earlier, even if Infosys beats its guidance for the year and the reported profit is close to Street expectations, valuations are stretched at over 21 times earnings. The current share price factors in a sharp recovery in the next fiscal year and is also, to some extent, pricing in growth, in FY12. This may be too premature, and investors would do well to heed some of the caution of the Infosys management.